Decontamination After Radiation Exposure: Simpler Than You May Think : Shots - Health News Dozens of people at and around the Fukushima Dai-ichi power plant reportedly have been decontaminated after exposure to radioactive material. So what's involved in decontamination, and how do you know if it's needed? 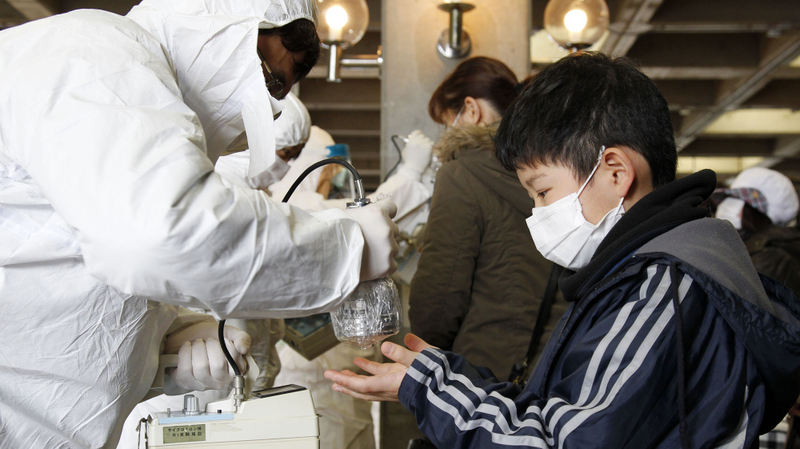 A boy evacuated from Koriyama, some 37 miles from the Fukushima Dai-ichi plant, gets scanned with a Geiger counter Wednesday. The Japanese government says 20 workers at the disabled Fukushima Dai-ichi power plant have been decontaminated after exposure to radioactive material. Dozens more, at least, have reportedly been decontaminated within the 12-mile evacuation zone around the plant after Geiger counters picked up evidence of radiation exposure. That made us wonder just how someone gets decontaminated from radiation – which, after all, is invisible, odorless, tasteless and generally insidious. Most people think of it as "rays," which is partially correct. "Decontamination is very simple," says Dr. Eric Toner of the University of Pittsburgh's Center for Biosecurity, who has studied what might happen in the wake of a terrorist's "dirty bomb" attack. "As a rule of thumb, 80 percent of decontamination is removing your clothes," says Toner, an emergency physician. "And 95 percent is removing your clothes and taking a shower — if possible, shampooing your hair. That's all that's involved. No fancy chemicals." That's because radiation is carried on dust particles. "The air isn't radioactive, but small dust particles are," Toner explains. "You're essentially washing off the dust." Dry air, when dust gets kicked up in the air and disbursed over longer distances, is bad. By the way, the dusty clothes can often be decontaminated simply by washing them, but it depends on the amount of radiation detected. "If you have reason to think they're heavily contaminated, they should be disposed of properly," Toner says. That means put in a plastic bag and, if possible, taking them to authorities for disposal. All this raises another question – how to decide if somebody needs to be decontaminated. At a place like the Fukushima power plant, where workers wear dosimeters that constantly record exposure and the environment is being continually monitored for radioactivity levels, the decision is clear-cut. But it's far less so out among the general public. In a situation like the current one, there's a profound lack of information on radiation levels at different distances from the power plant and how they might be fluctuating over time. In an emergency room or post-disaster setting, Toner says doctors would usually use a Geiger counter to screen people – before decontamination, to see if they've had any detectable exposure to start with, and afterward, to see if they still have traces of radioactive dust. There is a lot of Geiger-countering going on in northern Japan right now – as most TV-watchers know by now. But using Geiger counter readings, given in "counts-per-minute," or cpm, is not necessarily a great way to know if you need decontamination. Or whether it's time to start taking potassium iodide pills to protect against thyroid cancer. Steve Herman knows about that. He's a correspondent for Voice of America who got a Geiger counter scan Thursday in Koriyama, a town 37 miles from the Fukushima Dai-ichi plant as the crow flies. "My body 1,500 cpm, my boots 3,000 cpm. Another reporter: 10,000 cpm on her shoes," Herman tweeted. What to make of those readings? It's hard to know. "It is really hard to interpret Geiger counter cpm's," Toner says. "They vary from machine to machine. For example, they depend on the size of the probe – the bigger the probe, the more counts detected. And each machine must be calibrated against a known source (of radiation). Translating the cpm's to an actual exposure does take a health physicist." In addition, Geiger counter readings don't tell you a thing about the type of radiation a person may be exposed to – whether it's a fairly weak and short-lived isotope that doesn't pose a health risk, a form of radioactive iodine that signals the need to take protective tablets, or a more sinister isotope, such as cesium-137, that can raise long-term health risks if it gets inside the body. And this is the most worrisome form of contamination – internal contamination. The bad stuff on skin and clothes is easily washed off. But once radiactice particles get inside the body – through breathing in, but more importantly from ingestion – it can remain in tissues, possibly wreaking submicroscopic havoc, for a lifetime. That's why Thursday, Japanese authorities activated provisions of its Food Sanitation Act, which allows the government to test food for radioactive contamination and pull it from the market. Experts say it was the Soviet Union's failure to do that, for many weeks after the 1986 Chernobyl power plant disaster, that caused most of the health consequences – which continue to this day.